Below is a list of the top 50 travel blogs for the 4th quarter (October – December) of 2012 ranked by visitor traffic. 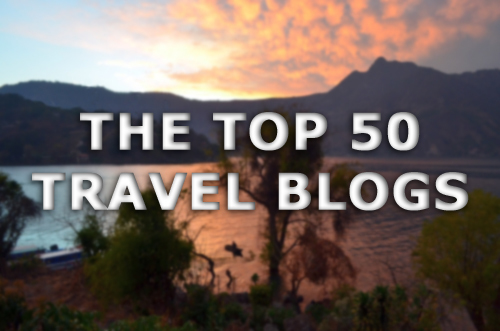 There are a few other sites that have put together their own lists of the “top” travel blogs. However, each has their own subjective means of ranking sites, using everything from Alexa scores, Twitter followers, Facebook likes, estimated traffic, inbound Google links and even subjective design criteria. My intention was to create the most objective and accurate list of the most popular travel blogs. Therefore, this list is based solely on the number of visitors a travel blog receives. To read more about how this list was put together, please read below. I reached out to a large sampling of travel bloggers and asked that they provide me with a screenshot of their Google Analytics page reflecting their site’s visitor statistics over the third quarter of 2012. The reasoning behind this method was that I wanted to obtain a rolling average to compensate for monthly spikes that may have occurred. Further, utilizing Google Analytics as the uniform measure of traffic helped to ensure uniformity of data across all sampling. If you are a travel blogger who would like to be considered for inclusion in the 1st-quarter of 2013 list, please e-mail me a screenshot of your Google Analytics page reflecting your site’s overall traffic from January 1 – March 31 to: [email protected].